There is no shame in admitting your parking lot no longer looks like it did when first installed. Even if your parking lot is in excellent condition, you deserve a reliable lot that empowers customers, staff, and others to reach your facility with ease. It’s even possible your business could benefit from parking lot improvements. Regardless of which of these scenarios applies to your property asphalt paving services are the solution. If you need any sort of pavement repair or parking lot maintenance, ACPLM is your go-to provider. 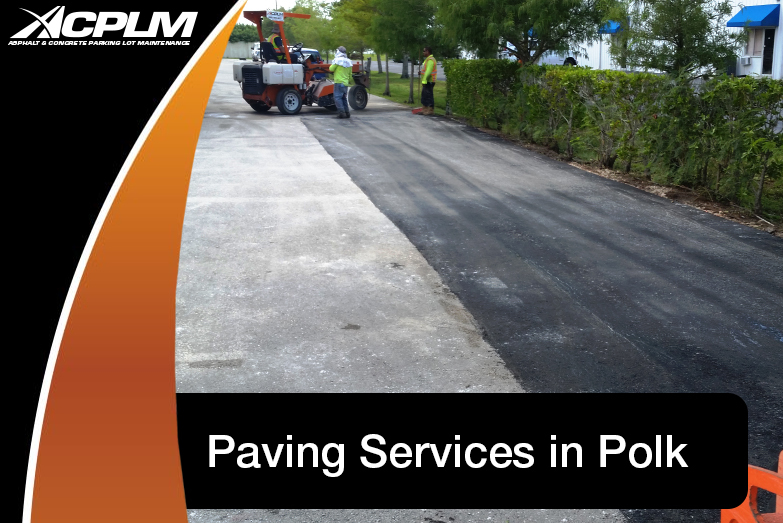 Our paving services are known throughout Florida for good reason: we provide the highest-quality materials and build surfaces that stand the test of time. We service industrial and commercial clients throughout the region. Asphalt typically lasts between a dozen years and 30 years. The surface’s useful life hinges on the manner in which the pavement was initially installed. If you spot any sort of crack, pothole, or dip in your pavement, it is time to contact ACPLM for a quick yet thorough repair. Such flaws in parking lots, roads, and other work sites are especially common if your property endures heavy traffic. Let ACPLM repair your pavement and you will not have to worry about a budget-busting repair project that uses your funds. Our asphalt repair paving services include crack filling and the patching of holes. If necessary, we will dismantle and replace your compromised asphalt pavement. Asphalt just might be the most versatile paving material around. This material is used for everything from roads to playgrounds and even airport runways. Asphalt can be used for an unlimited number of commercial and industrial purposes. This low-cost material is also revered for its affordability. It requires minimal time to apply and cure. So don’t worry about potential interference with your business. We work with precision and speed for a fast turnaround and as little disruption as possible. Those who are interested in paving services provided in an environmentally-friendly manner will find asphalt is a green material as asphalt can be recycled. Put your faith in ACPLM’s paving services and you will find the installation or repair of your asphalt will go much smoother than anticipated. Give us a chance to improve your property and you will find our paving services are second to none. Give us a call at 888-959-9637 to learn more about how we can beautify your property. You can also reach out to us online through our convenient online contact form.